I’m not quite certain when we met. She attended a congregation where my best friend’s father served as the evangelist. Surely I’d met her during a trip to visit him, but I can’t remember. I do remember asking her out on a date in July. It was 1975, I think. But now that I’m old I’m not positive about that year. I am sure of the circumstances and the event. It was a church meeting in Oklahoma. I’d driven up from Baton Rouge. She arrived with friends from Ft. Worth. It was an annual event that I had attended my entire life. I didn’t recall her ever being there, until that year. I had asked my best friend about her. What kind of girl is she? What kind of sense of humor does she have? The typical questions I asked. He bragged about her. Said he liked her quite a lot, not like I was hoping to, but as a good friend. She was good friends with his sister. She was easy to get along with, not stuck up and had a good sense of humor. He wanted to know if I was going to ask her out on a date. I told him I was thinking about it. He told me I should. For the next few days we were a couple. I didn’t know about her, but I knew I was in love. Falling harder every day. At the end of the meeting we all drove to Ardmore, Oklahoma where my best friend’s family now lived. She was there, too. I was thankful to have more time together. For about the next 3 years we would write letters – yes, those handwritten kind long before computers, texting, cell phones or Skype. No, we didn’t use quills. Thankfully, the ball point pen was a old staple of writing by the mid-70’s. A stamp a day. I don’t remember how much they cost when we began writing, but we both noticed when the postal service hiked the price. As for phone calls – well, kids, this is back before Vonage and free long distance cell service. Phone rates were at their highest during the work hours on week days. The rates went down on the weekend, but they were the very cheapest after 11pm on the weekend. That’s when we’d call each other. Long distance dating cheap skate style. She worked at the Waffle House. I was selling stereo gear. She attended a local community college. I was duking it out with courses at LSU. She was smart and studious. I was smart. She made straight A’s. I juggled the schedule trying to make sure I dropped a course I was failing before it drove down my GPA. Time rolled on and we were moving right long. Fast, considering we were hundreds of miles apart. She in Ft. Worth. Me in Baton Rouge. Once in a blue moon I’d talk my boss in letting me have the most sacred day in all of retail off, Saturday! I’d attend class. Go to work at the stereo shop until we closed. Drive all night to Ft. Worth arriving around 6am, then spend the weekend with her and her family, shoveling the housing arrangement into shambles. She had 4 sisters and 1 brother. It was not a large house, but I had a room to myself. I still don’t remember where they all slept. We’d go to church on Sunday morning – that same church where my best friend’s dad was the evangelist once upon a time. It’s the same congregation where we still worship today. And our kids, with their kids. Little did I envision that happening some day. We’d grab a quick lunch after church, then down the road I’d go…making the 11 hour drive back to Cajun country. The highways are much better now and you can make that drive in about 7 hours. Not so back then. The plan was hatched. At some point, the date was set – January 2, 1978. 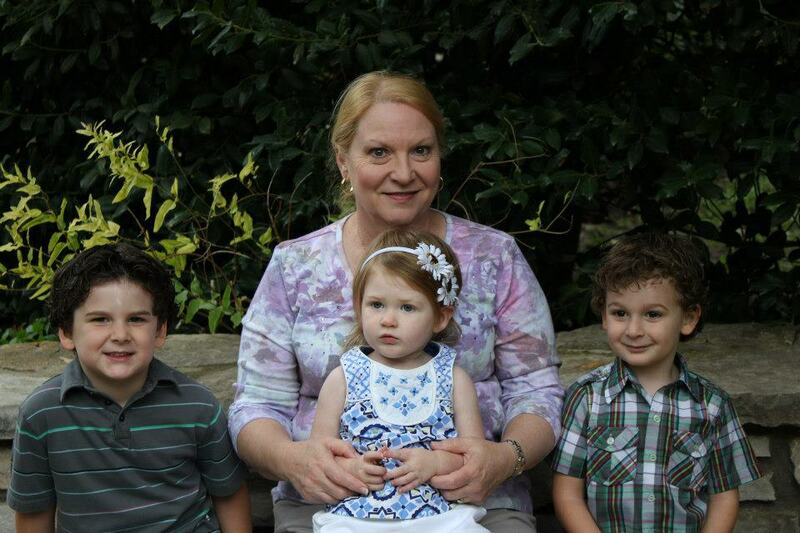 That evangelist – my friend’s dad – he married us. In the same church building where we now worship. Today, 35 years later – there’s too much to say. Too many memories to recall. Too many tears. Too much laughter to even remember what was so funny. A lifetime, really. Young love is different than when you’re older, but not so much really. It’s deeper. Comfortable. Not in an unappreciative sense, but in a “don’t know what I’d do without you” sense. I’m not sure when I felt like we had always been together, but over time it hits you. This lifelong partnership and love affair just seems to have always been. However much I thought I needed her when we were both just about 6 months shy of being 21 – January 2, 1978 – I didn’t really have a clue. Thirty five years later I’ve got a much better idea of it. It’s a dependence you can’t describe. And I’ve never tried. Because it’s just too deep to explain to somebody who’s never been blessed to experience it. There are times it can be so deep that it’s painful. But it’s not. We’re growing older, but I’m not sure if either us is riding with less enthusiasm. I always did prefer blondes. I love you, Rhonda. P.S. 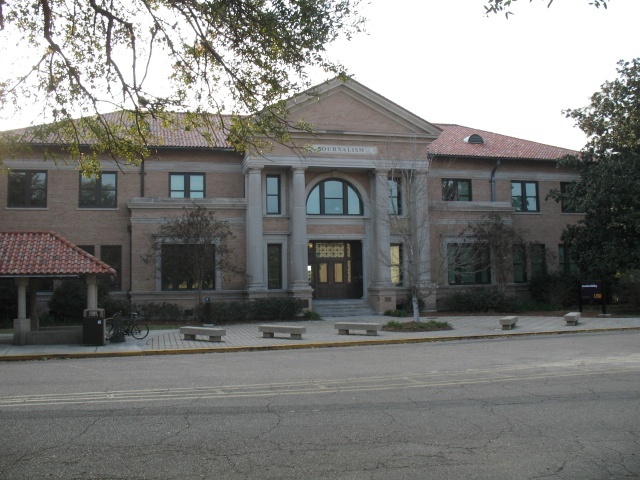 We closed out 2012 with a return trip to Baton Rouge – the first time back since we left over 30 years ago. Talk about experiencing a flashback, but in a good way! 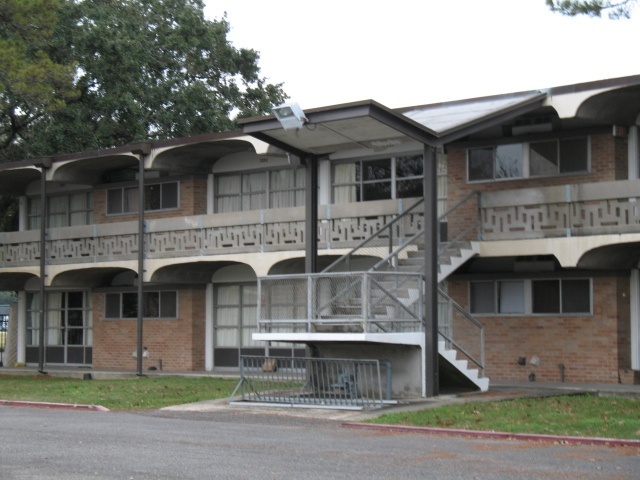 Up at the top of the stairs to the left was our first “home.” Six hundred square feet of concrete wall and linoleum floors. But it was blissful really. Honestly, I could go back today if I had to and be perfectly happy. Maybe happier. Funny how that works, huh? After a few miserable years struggling in electrical engineering – a pursuit that was ill-suited for me – I finally went with what I knew I loved. Words. Writing. Talking. Communicating. The Dean of Engineering sat down with me, a requirement at the time if a student wanted to leave one “school” to enter another, and warned me, “You can’t make any money in journalism.” True Dat! Thankfully, I never tried. Sales and management proved too lucrative, but my love of words and communication has persisted throughout my life. 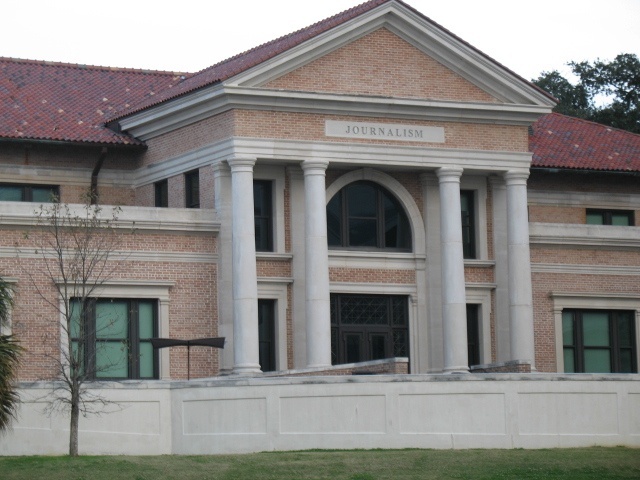 The day I was accepted into the School of Journalism, I felt immediately connected and academically whole. Sadly, I had lost a lot of time being miserable in the School of Engineering. A major life lesson learned – soar with your strengths. Now you know the roots of my passion for Rhonda and for communication. Both have been a lifelong pursuit. Both are very connected. And both define me. A man’s journey toward wisdom is long and full of twists, turns and round-abouts. If the last 35 years are any indication of this new one, then I know I’m in for a ride. I have no idea how it’ll all turn out. And I’m uncertain if the destination matters as much as folks like to think. Eternally, it does. But here? I don’t think it’s nearly as critical. The experience, the lessons learned, the setbacks, the challenges, the pain, the joy, the laughter and tears – those are likely the things that build wisdom and form us. 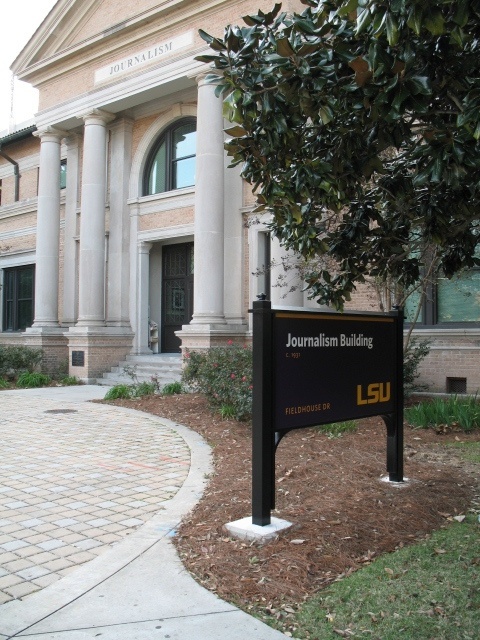 When I attended LSU I spent countless moments walking corridors such as the one pictured below (including that one). 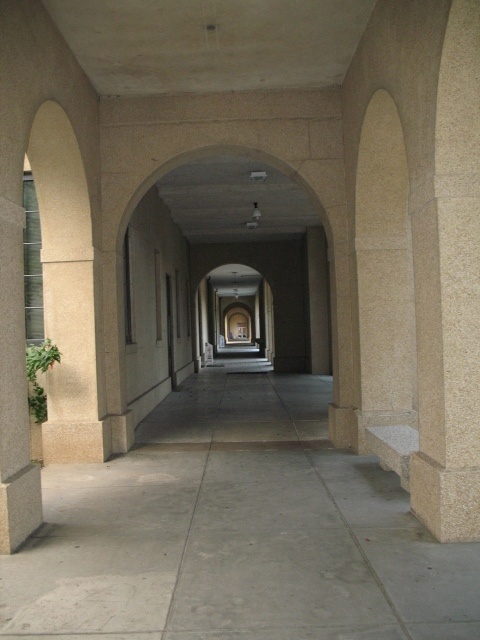 When it rained, as it often does in Baton Rouge, students would run from outside sidewalks to find cover in these hallways. Racing from classes, darting in and out of classrooms, connecting with others – the energy found in those moments between classes was often more important than anything else. They’re far more memorable than any single lecture I ever heard. And that seems to be how life works. Experiences matter! People matter. Couple them together and you’ve got magic. Incorporate them into family and “brethren” and you’ve got the best this life has to offer. Previous post: Special Episode – 2013, Come On Down! This Year The Price For Your Success Will Be Right.